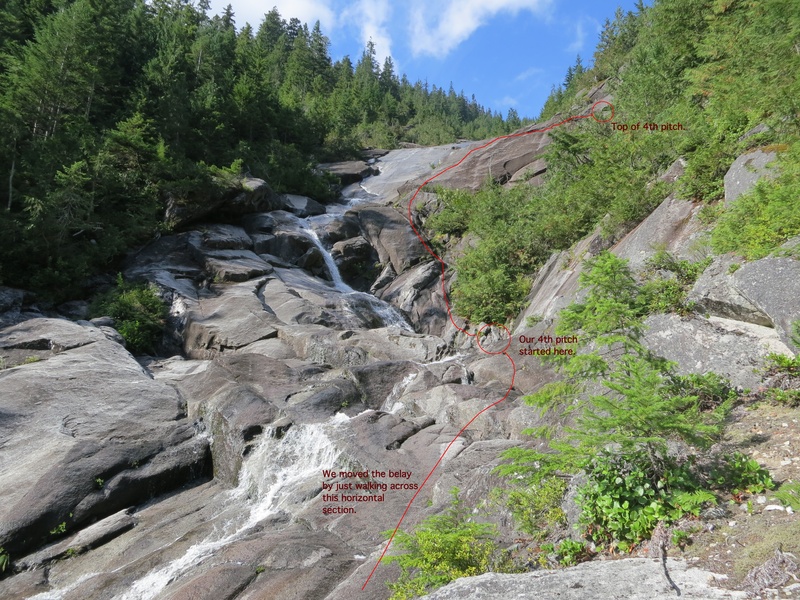 Every technical climbing route I’ve done up until this point has had a guidebook entry, a trip report from someone else online, or at the very least some terse words from Fred Beckey. 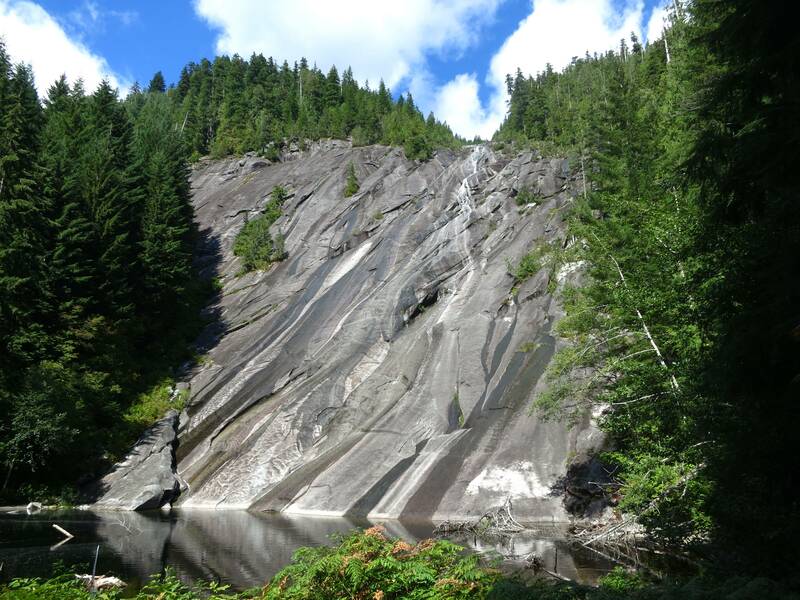 However, Gerry has had a dream of climbing the dry rock up the side of Otter Falls (WTA, WaterfallsNW) for three years now, but we could find absolutely zero trip reports from people who had done this before to give us beta beyond a vague reference that someone’s dad did it a long time ago and a photo of the upper falls. So, on Sunday September 8th, we set out to tackle the unknown. See all photos. Gerry picked me up in Queen Anne at 7:30am. 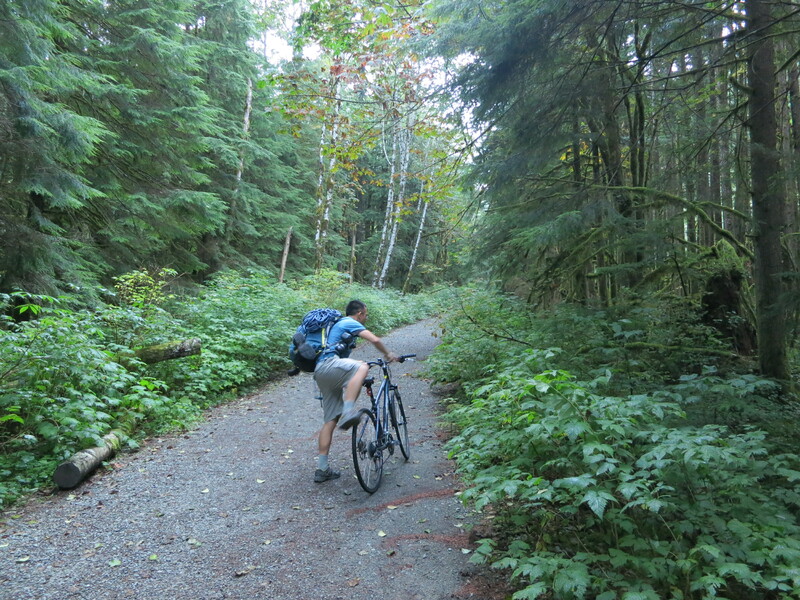 He has a bike rack, and we brought bikes to make the five miles of relatively-flat trail pass quickly. The Middle Fork Road has developed quite a few potholes by this time of year, but Gerry handled them just fine in his Camry. We were parked at the gate and unloading the bikes by 9am. The bikes worked pretty well on the trail. It was a really bumpy ride, and having shocks on the front tire helped tremendously, but there were many places where it was rough enough to necessitate walking the bikes a short distance. Still, it made the 5 miles go by quicker and with less monotony than they otherwise would have. 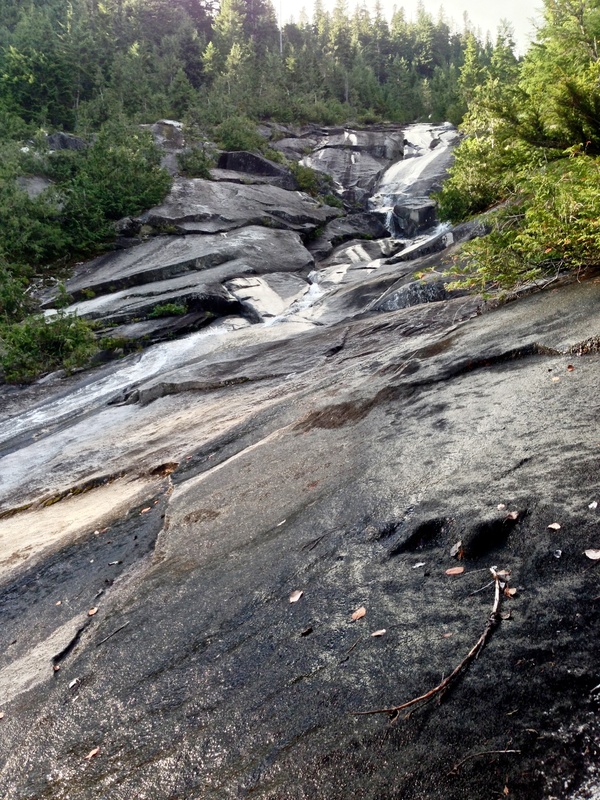 We intentionally passed Otter Falls, arriving at Big Creek Falls at 10:20am. 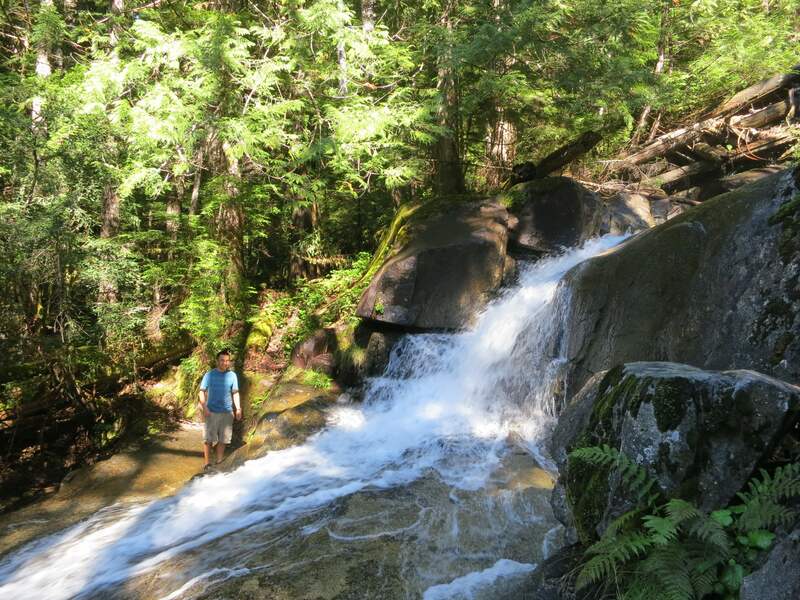 Gerry says that scrambling up Big Creek Falls is pretty much his favorite thing to do in the Cascades. The falls are a seemingly endless series of slabs and 15 foot waterfalls that each plunge into clear emerald pools, and can normally be done barefoot. Today though, things were wetter than he had ever seen them, making the scrambling quite a challenge to pull off the friction moves at times, and sometimes necessitating a bushwhack bypass. We continued up this until noon, turning back before the valley opens up in the interest of time. Gerry wore Tevas and I wore Vibram Five Fingers. The Five Fingers seemed to be the ideal footwear for this, they have excellent grip on wet rock, and fantastic sensitivity for feeling out tricky moves. We were back at our bikes by 1:05pm, rode a short way back on the trail, locked up the bikes again, and headed up the Otter Creek side trail, arriving at Lipsy Lake at 1:20pm. 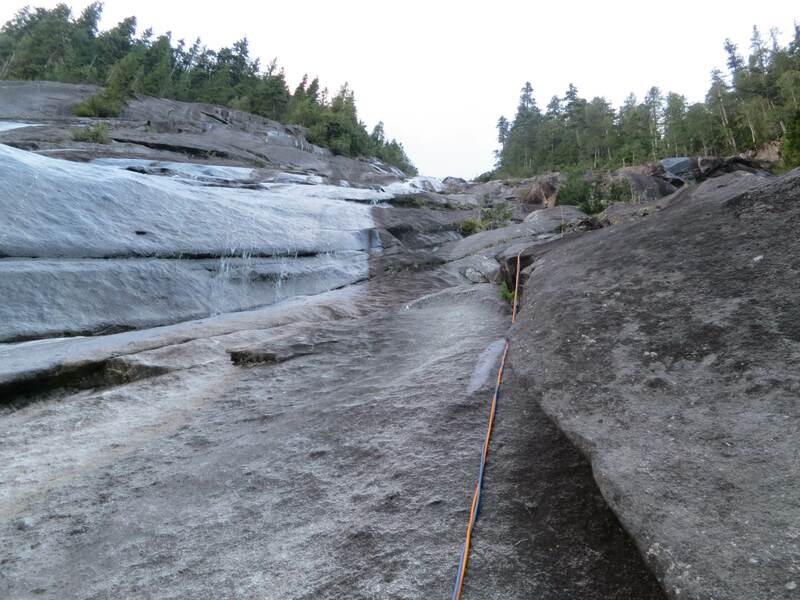 We geared up on the shore of Lipsy Lake, donning harnesses, rock shoes, helmets, & the rack; but we carried the ropes still-coiled until we set a belay anchor at the bottom of our first pitch. 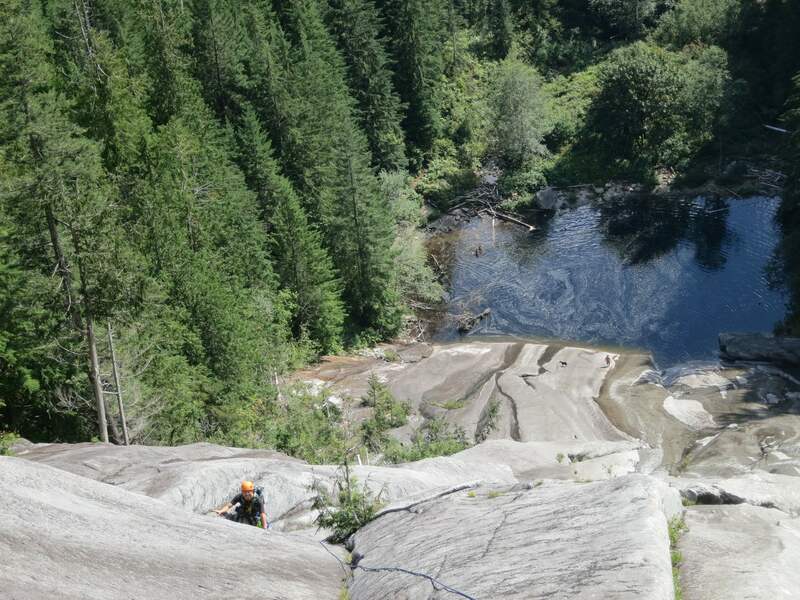 Gerry and I each brought a rope (his was 70m, mine was 60m) so that we’d be able to do full-length rappels later on. There’s just enough of a rocky shore on the right (east) side of Lipsy Lake to get onto the main rock face with dry feet. Once on the friction slab, it starts out lower-angle than it looks, and with rock shoes on you can simply walk up it with confidence (Gerry’s done this part before in just sandals.) We went up, and then left, and got to a corner system that I’d describe as a tall backwards-C-shape, or perhaps the shape of a closing-parenthesis. This is close to the waterfall, but it was dry at this time of year and it had a crack running along the corner that took 3″ to 4″ gear. You could bring a #4 Black Diamond C4 for this spot, but it’s the only spot on the route where you’ll use it. A #3 also fits, though I’d recommend supplementing it with one or two of the largest hexes you own. There’s no need for doubles of cams. At 1:45pm, we built a 3-piece belay anchor here, flaked the 70m rope for leading, and Gerry continued to carry my 60m rope in his pack for later. I led, and the climbing was all less-than-vertical friction slab. I’d call it a 5.5 or lower, it was slightly easier than the first pitch or two of R&D in Leavenworth. It was pretty run-out between protection opportunities, but the climbing was easy enough for me to still feel comfortable with it. Half my pro placements were girth hitches around small cedar trees that were sticking out of the rock here and there, so I was constantly using the three double runners I brought, but there was also the occasional crack I could plug a cam or tricam into. Black Diamond C4 sizes #0.3 through #3 were useful, but definitely just singles of them, since you don’t get that many places to place them. 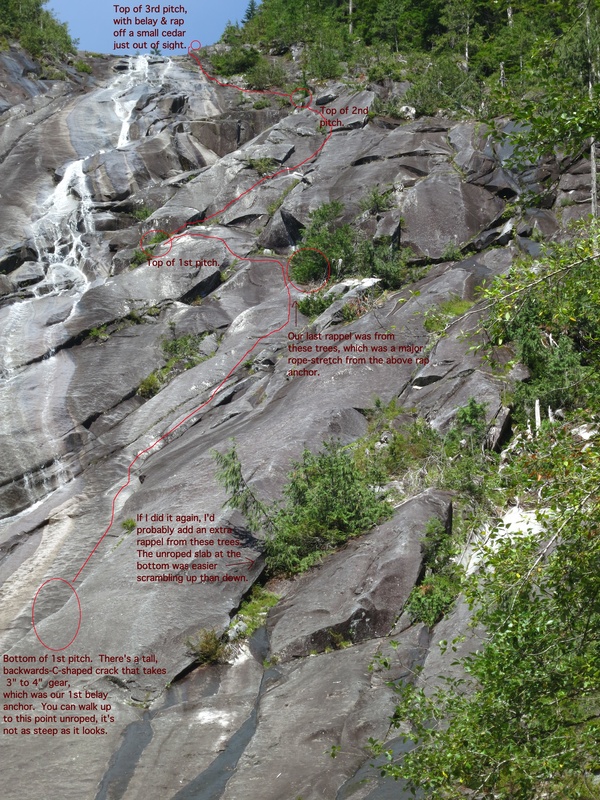 We did three pitches, all ending at small cedar trees for belays, each almost a full rope length, to get to the top of Otter Falls as it would be visible from someone standing at Lipsy Lake. This would be a fine place stop & turn around for anyone who might repeat our route, since it’s rewarding, and it’s got a pleasant view of a part of Otter Falls you can’t see until you’re up here. We were curious what came next though, so we had to try out a 4th pitch to see if it was any good. This required moving the belay horizontally upstream about a rope length. 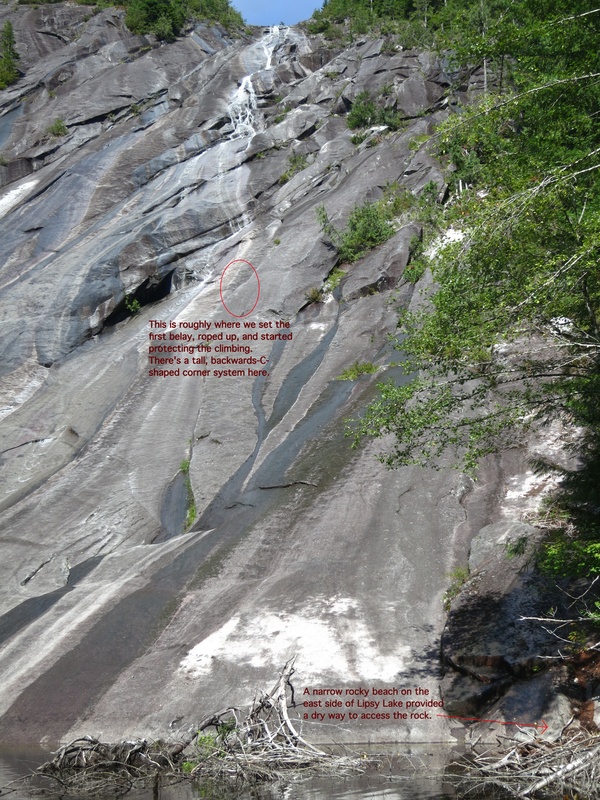 Our 4th pitch elbowed out quite a bit to climber’s left. Getting up to that elbow point was the hardest climbing of the day, mostly because it was the only part of our Otter Falls route that wasn’t dry. I’d call it a 5.8 for a move or two, but probably a bit easier if it were drier. It didn’t help that the protection opportunities were only so-so. At one point I was desperately clawing the dirt out of a runnel water was streaming through in hopes submerging the head cam to grip the rough granite down there. In the end, the cam didn’t fit, but I somehow pulled the move anyway. 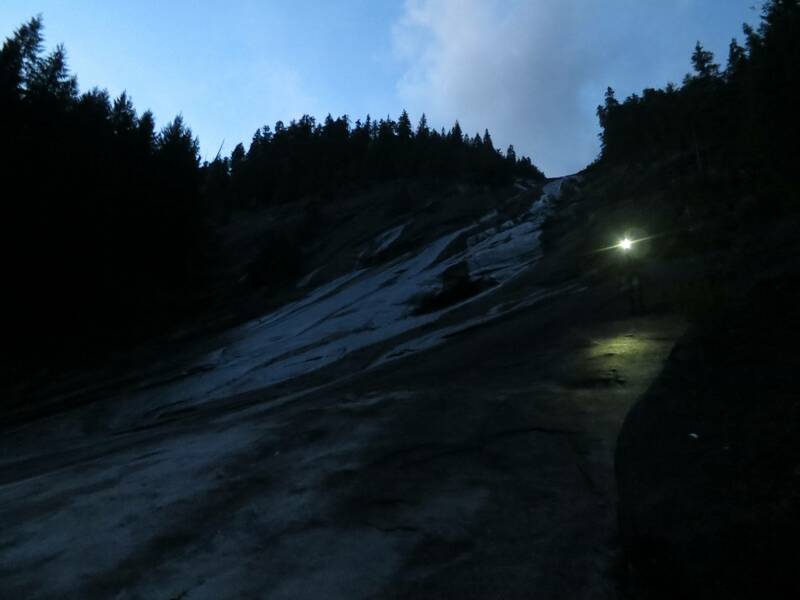 After the elbow of that pitch, the climbing became much easier, a dry less-steep friction slab again, but with pretty much no place for pro. I made friction steps up and over to the right to find a tree to belay from. Gerry joined me here at 5:06pm. He continued up the moderate slab a bit further while I made a rappel anchor. We made a rappel anchor on that same cedar with two separate pieces of water-knotted webbing going to a single rappel ring. Luckily I had exactly 4 rappel rings with me, so we never had to leave behind anything but those and cheap webbing. We tied the two ropes together with a flemish bend with double-fishermen’s knots on its tails. Continuing down, we used the same trees for rappelling that had been belay anchors at the top of pitches #3 and #2 as well. While rappelling pitch #2, I tried to get to a cluster with some larger trees to serve as the last rappel anchor, but it was a real rope-stretcher for the 60m rope. I ended up using a tree near the top of the cluster as a rappel anchor, but that did increase the risk that the knot joining the ropes could get caught up in the lower foliage when it came time to pull the rope. Luckily it didn’t get stuck. Also, I’m hugely embarrassed that just before I put my belay device on the rope, I was sure it was clipped to a carabiner, so I let go of it for a moment, only to immediately here the clatter of metal rolling down the slab, and I watched it go out of sight below. So, a munter rappel it would be. I had been rappelling with the ropes as “saddle bags” on each rappel, but using the munter meant the ropes twisted in their saddlebags and became horribly horribly tangled. It took me 30 minutes to get down to the end of the ropes, fighting with the nasty tangle the whole way. We ended up back in the tall backwards-C-shape at 7:30, with dusk setting in. But, on the bright side, my belay device had rolled to a halt there, so I got it back! We coiled the ropes, and gingerly did the rest of the friction slab to the bottom unroped. 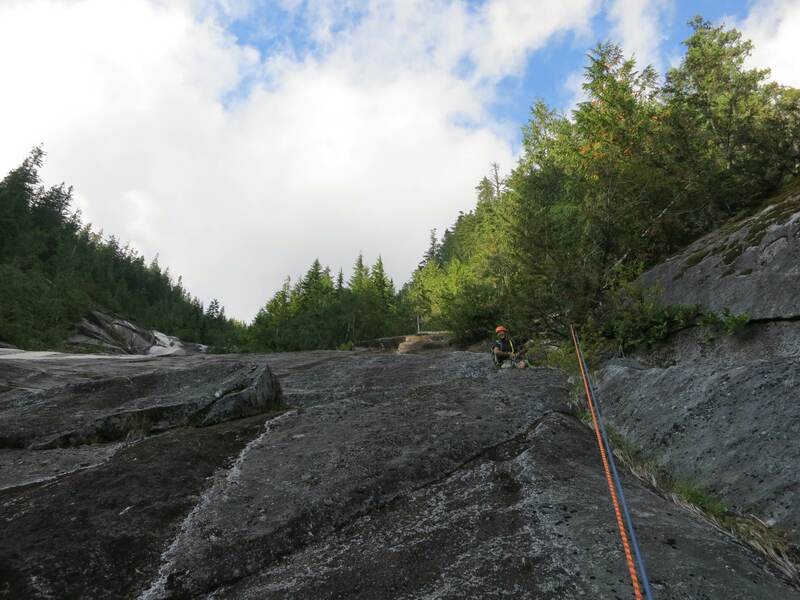 If I were to do this again (and had more time before dusk,) I would have swung to climber’s right while rappeling our 1st pitch, and tried to reach another cluster of cedars so I’d have an option of rappelling all the way down. That bottom unroped scramble was easier going up than it was going down. Plus, I was feeling a bit drained of energy by the end of the day, and I would have felt more protected from a tired misstep if I could rappel it rather than scramble it. Anyway, we were finally back to our packs on the shore of Lipsy Lake a little after 8pm, and it was completely dark out shortly after that. It was wonderful to change back into sneakers after having been in my rock shoes for so long. We packed up and got back to our bikes at 8:20. We rode the trail completely by headlamp, which made it a bit challenging to dodge the big rocks and stop in time for stream crossings, but somehow we did it all unscathed! (Well, unscathed save for a thousand very minor scratches from all the trail-side plants that whacked my arms & legs during most of the ride.) We cheered upon reaching the parking lot at 9:20, got the bikes back on the rack, and headed for I-90. Since it was past closing time by the time we would have arrived at most of our end-of-day food stops, Gerry had the brilliant idea of waiting until Seattle and going out to Beth’s Cafe. The day ended with some incredibly satisfying eggs, hashbrowns, and hot chocolate, and Gerry dropped me off at home at 11:30pm.